APPLE, SURPRIZE (Malus domestica Surpize). Fruit. Stunning new variety unlike any others, developed and recently released by the award winning grower William Barnet from Herefordshire. 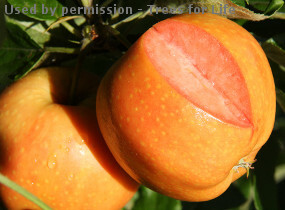 The apples have a brilliant, glossy, golden orange skin, enclosing an amazing pink flesh. The aromatic apples are firm flleshed, crisp and very juicy with a delicious flavour. This is a quirky, tasty new addition of the many wonderful English apple varieties. If picked in September and stored well it is still excellent up to Christmas. This plant is in pollination group 1 and requires a pollinator, choose a tree in group 1 or 2 (listed below).